What makes a fool a fool? That is the question I asked when I saw the recipe...not when my husband and his friend were clowning around. After a little research I learned that this British dessert is one that is created when a sweetened fruit puree, most commonly made from strawberries, raspberries, or cherries, is gently mixed into whipped cream, resulting in a marbling effect. It is the perfect summertime dessert: simple and light. But why is it called a fool? I learned that when referencing fool with fruit it most likely is derived from the French verb, fouler, which means to press. Cooks, during medieval England - dating to the 1500s, made fools by pressing ripe fruits into a pulp. The pulp was then combined with sugar and poured into freshly whipped cream. 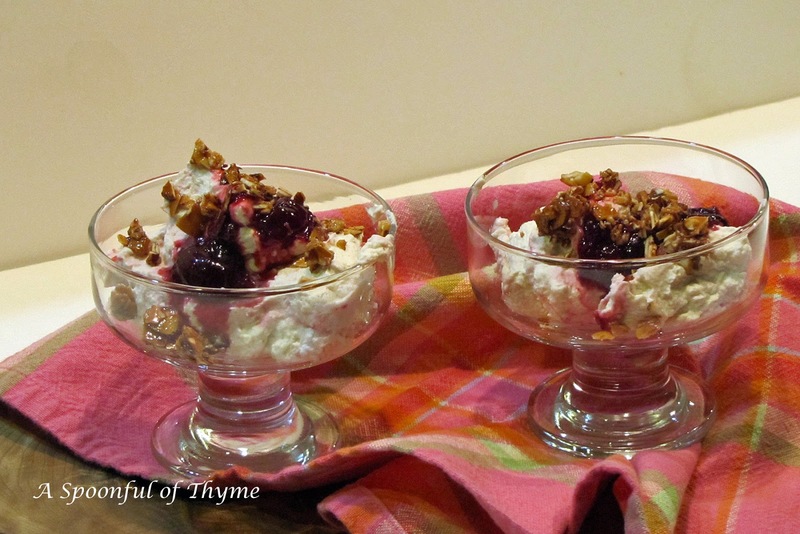 A "fool" was a refreshing way to end a meal during the warmer spring and summer months. 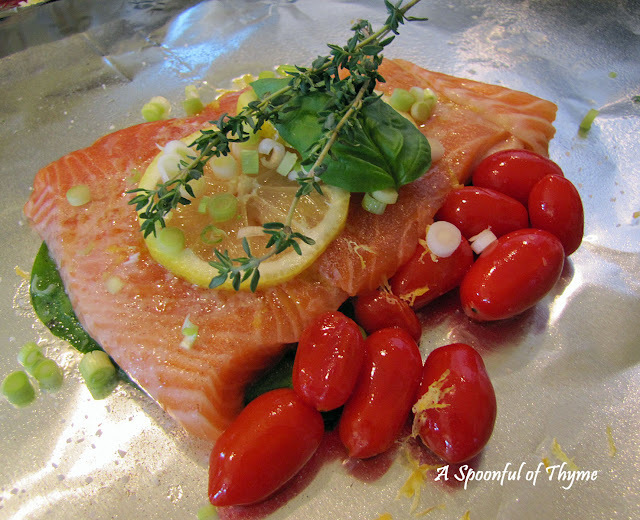 I found the recipe at Lea Ann's blog, Cooking..on the Ranch, aka Highlands Ranch Foodie. Lea Ann has an amazing blog and if you have never visited, take a minute or two and stop by. You are certain to return. In a small bowl, coat nuts with honey. Spread nuts on the baking mat. Bake 5-7 minutes, until golden. Transfer nuts to a bowl to cool. Coarsely chop, and set aside. In a separate bowl, combine cream, brown sugar, and vanilla and beat until stiff peaks form; fold in 1/3 cup of the cherry sauce. Combine, but not fully - there should be beautiful cherry streaks running through the fresh cream. Divide among four dessert dishes, and spoon remaining cherries over the top. Garnish with the honey almonds. NOTE: This dessert is not very sweet. You may wish to taste the cherry mixture and adjust the sugar if you desire a sweeter dessert. This dessert will visit our table often...with the abundance of ripe berries during the summer, why not? Cherries and almond...the perfect marriage! 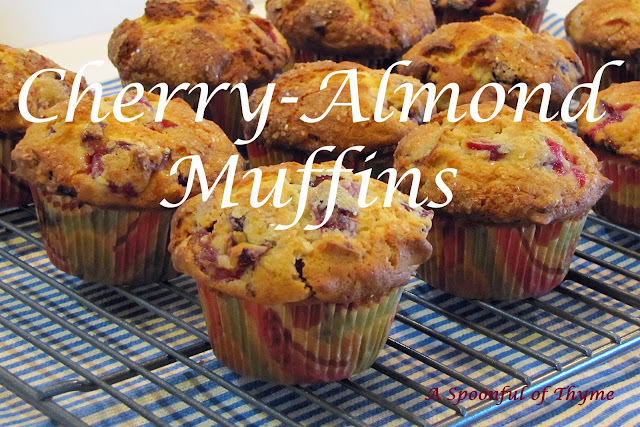 With an abundance of cherries on hand, making something with cherries and almond was a must. 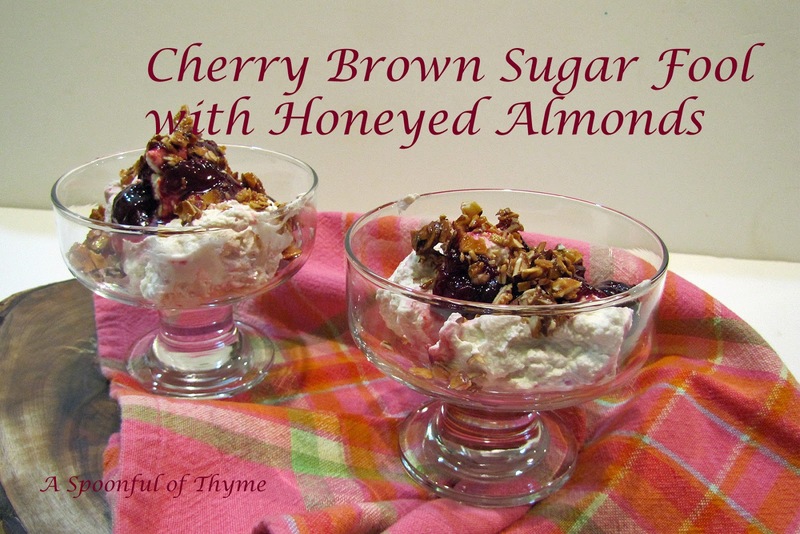 Cherries and almond are made for one another...it is a wonderful flavor combination. 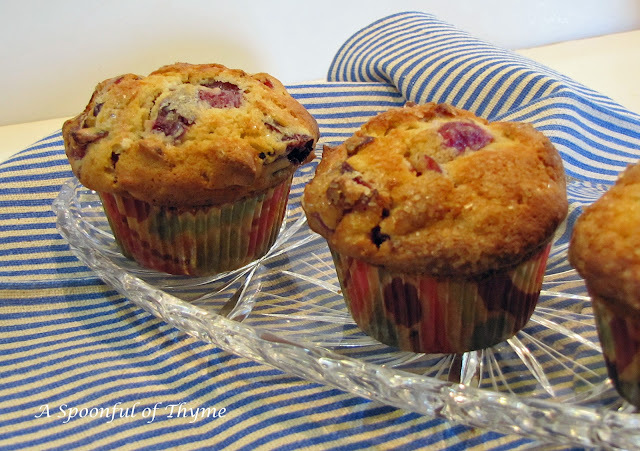 During my cherry recipe search, I found this one from King Arthur Flour. I did make a slight change. Instead of 1/2 cup of milk I used 1/4 cup of milk and 1/3 cup of sour cream...the muffins were light and tasty...but of course, they were tasty, there are cherries and almonds! Cream butter and sugar until fluffy. Beat in the eggs, one at a time. Mix in the sour cream. Sift together the dry ingredients and add them, alternately with the milk to the butter/sugar mixture. Stir in the almond extract and vanilla, then gently fold in the almonds and cherries. Spoon the muffin batter into 12 greased muffin cups. The cups will be quite full. Sprinkle each muffin with a bit of raw sugar. Bake in a preheated oven for 20-25 minutes. Check the muffins at 20 minutes. We enjoyed the muffins with a cup of coffee in the morning. And, yes, I shared with my neighbor! It is cherry season! They are in abundance! Our neighbor brought over a gallon bag of cherries the other day and the very next day, he and Mr. T. headed out to the orchard to pick some more. The farmer had already harvested and said that they could have what was left on the trees. There are a lot of trees out there....and it was a very warm day...they left with ladders, ice chests, buckets and water! 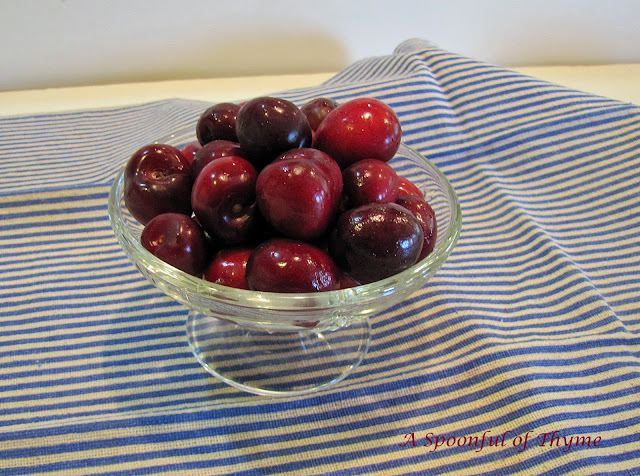 I remember fruit in bushel baskets...are you supposed to measure cherries by the bushel? That would be A LOT of cherries! The guys used an ice chest...one ice chest of cherries coming up! They had fun. 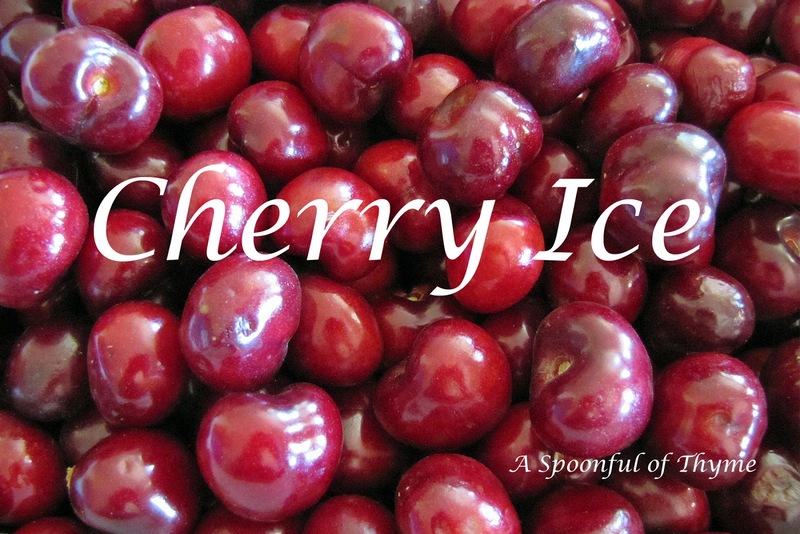 I was combing through all of my likely sources for various cherry recipes. When I saw the recipe for Cherry Ice, I figured it would be refreshing and a great treat after dinner. Mr. T even pitted a few gallon of cherries for me...bless him! In a medium bowl, whisk together wine, honey, and lemon juice until combined. Set aside. 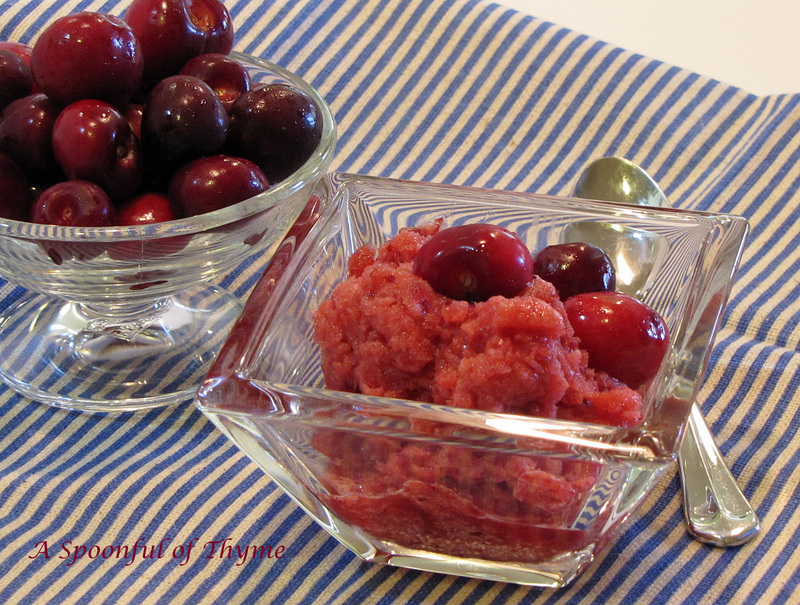 Place cherries in a food processor; pulse until finely chopped. Transfer the cherries to the bowl with the liquid mixture. Stir until combined. Pour into a shallow metal pan and place in the freezer. Stir with a fork every 10 minutes until mixture is slushy and partially solidified, about 35 minutes. Spoon into serving cups; garnish with whole cherries. A bowlful of cherries is always nice, too! We are skipping spring in the Valley and headed directly for summer. Yesterday with temperatures in the low 100s, a fruit smoothie seemed to be just the right thing. 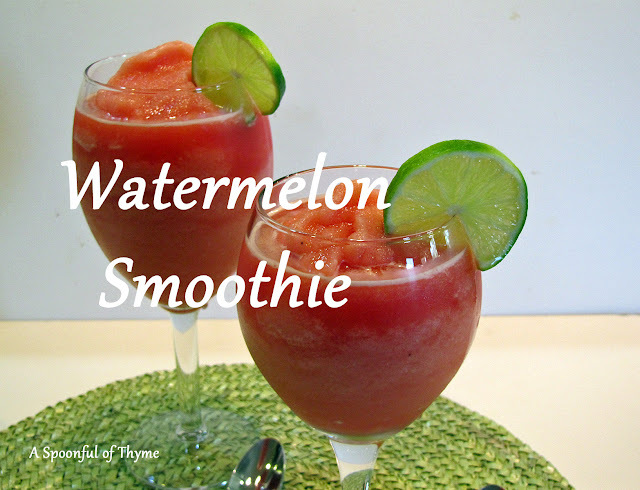 Timely, in that it is Secret Recipe Club time and I found a great watermelon smoothie recipe on Judee's Gluten Free A-Z Blog. It just so happened that I had a ziplock of watermelon chunks in my freezer! I know, it is an odd thing to have...it all started when the girls were little. When school was out for the summer, Mr. T. would work for Ag Department as a fruit inspector. He would start in the melons and as those fields were picked, he moved to table grapes. You can be assured that if Mr. T inspected the melons or grapes, you were getting at your market, then they were sweet! I digress...we had an abundance of watermelon one year so I put it into chunks, sprinkled a little sugar on it and froze it. 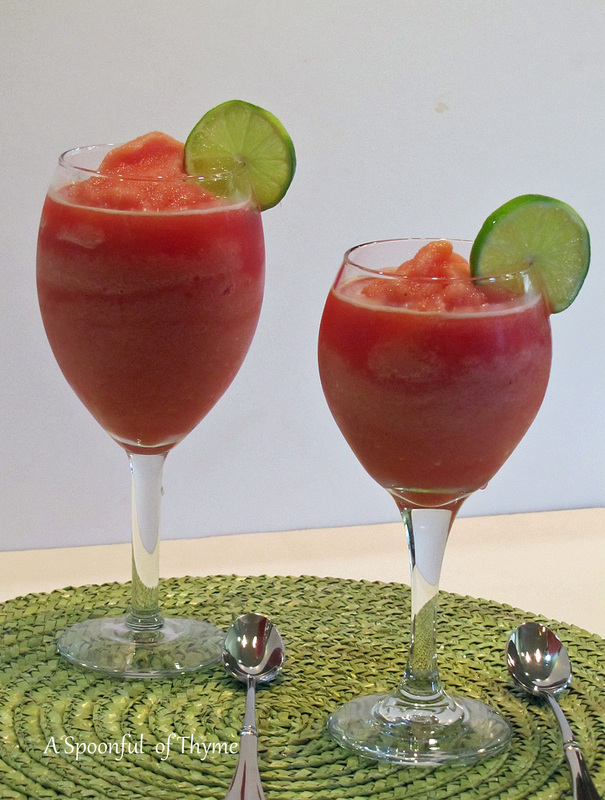 When the girls wanted something cold, I pulled out the watermelon, put it in the blender and whipped up a nice slushy drink. To this day, I freeze leftover watermelon for us. When I saw the smoothie recipe it reminded me of years gone by so I had to give it a try on this very warm day. What is different from what I usually did is the addition of the banana and the lime juice....so yummy....I did make a few changes. I only had two cups of watermelon and I wanted it thick so I added about 1/3-1/2 cup of water...basically, I eyeballed it! Place all ingredients in a blender and mix to the desired consistency. As you can tell this is a recipe that can be adjusted easily.....it was so refreshing! My girls missed out this time and Mr. T wasn't home so I met my neighbor at the fence (We meet at the fence quite a bit to share treats....) and we enjoyed this very refreshing and tasty treat. I am kindof excited...I have another bag of watermelon in the freezer and I have bananas and limes! If it doesn't cool down, I am going to have to whip up another batch! Judee is a gluten-free, vegetarian, health enthusiast. She had many recipes that I considered making...like the kiwi mojito....that is for tomorrow evening when I will once again meet my neighbor at the fence! I shared with the neighbors! It is time once again for the Dessert Challenge hosted by Lady Behind the Curtain. It is a personal challenge. 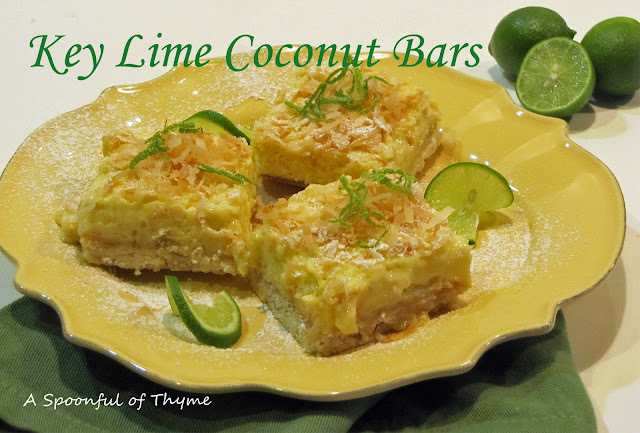 Participants are given two ingredients, such as lime and coconut, and must make something tasty! I had a hard time choosing what to make this month. I found some mouthwatering cupcakes that were at the top of the list until the last minute when I realized that I had made cupcakes for last month's challenge. Then I danced around with the thought of making a tart or rice pudding...but, I ended up with these sweet and tart Key Lime Coconut Bars, instead....it was not a mistake!! I enjoyed the roasted coconut in the pastry as well as the sprinkle on the top of the bars. I must admit, though, that juicing key limes takes a lot longer than anticipated! The are tiny little guys! Spread coconut on a rimmed baking sheet, and toast until golden brown, 6 to 8 minutes, tossing every 2 minutes to ensure even browning. Remove from oven; transfer to a plate to cool. In a large mixing bowl, combine flour and sugar, and add half the toasted coconut . Using a pastry cutter, cut the butter into the flour-coconut mixture until it resembles coarse meal. Pat mixture into a 9 X 13 inch dish and bake until golden, 20 to 25 minutes. Allow to cool slightly. Meanwhile, beat together egg yolks and condensed milk with a whisk until thick. Gradually beat in lime zest and juice. 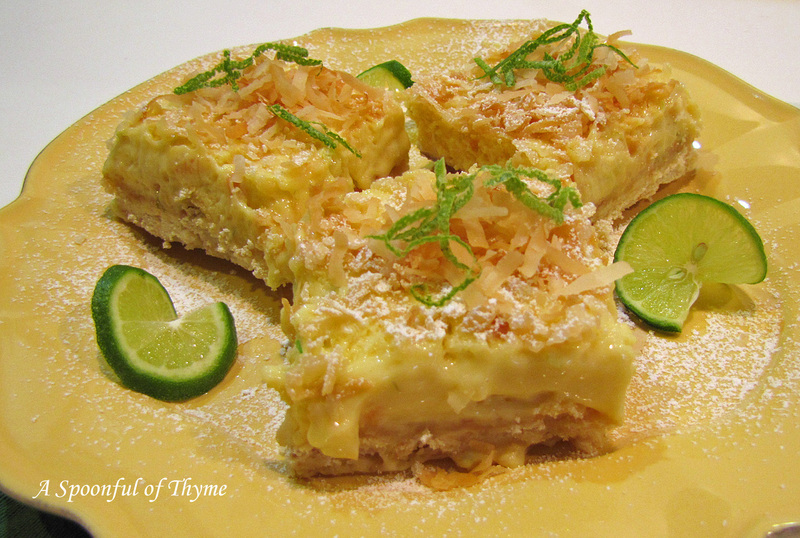 Pour into cooled crust, sprinkle with remaining toasted coconut, and bake until just hot, 6 to 8 minutes. Cool completely, then chill until ready to serve. Cut into squares. Before serving, sprinkle with confectioner's sugar, and garnish with lime zest, if desired. Next month's challenge is strawberries and raspberries! Yum! My daughter and son-in-law have a wonderful garden. I think they grow everything that can be grown in the Northwest! Not really, but close! They have beautiful raised beds as well as an area near their fence in which they cultivate berries, grapes, rhubarb, and artichokes, to name a few. They are even hosting two bee hives that were very active on the sunny days of my recent visit. 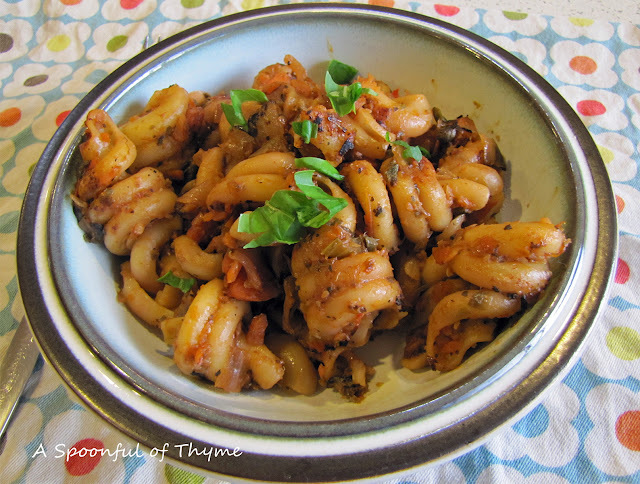 They discovered this wonderful tomato sauce that enables them to use up an abundance of fresh tomatoes. I love the addition of the sherry vinegar, capers and the red pepper flakes in this sauce. I loved every bite! In a sieve over a medium non-reactive sauce pot, strain the tomatoes of their juice into the sauce pot. Add the sherry vinegar, sugar, red pepper flakes, oregano, and basil to the tomato juice. Stir and cook over high heat. Once bubbles begin to form on the surface, reduce to a simmer. Allow liquid to reduce by 1.2 or until liquid has thickened to a loose syrup consistency. Place roasting pan on the middle rack of the oven and broil for 15 to 20 minutes, stirring every 5 minutes. Tomatoes should start to brown slightly on edges with light caramelization. Remove the pan from the broiler. Place the pan over two burners on the stove. Add the white wine to the tomatoes and cook for 2 to 3 minutes over medium heat. I think mixing up a big pot of sauce and then freezing it is a great idea for those days that I am just too beat to spend a lot of time in the kitchen....in fact, I think it is time for me to mix up some meatballs to add to the freezer, too! Do you need some spicy herbed nuts to snack on this weekend? This just might be the snack for which you have been searching. It is "the" snack. I couldn't keep my hand away from the baking sheet, the cooling rack or the bowl! I was getting worried that they would disappear before we left for our get together... I envisioned me arriving at our destination with an empty bowl and a sheepish grin....they are that good!! They are that simple! They are the perfect snack with cocktails or without! 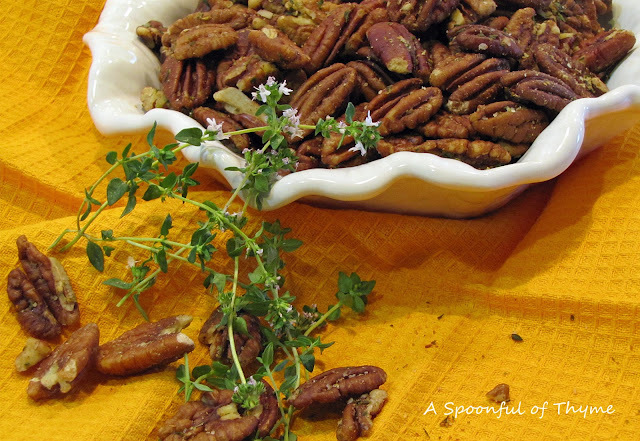 My friend sent me the recipe and there wasn't a credit on it...there was just the statement that the inspiration for these nuts goes to the late author, Lori Colwin, who shared her rosemary walnut recipe with Gourmet magazine many years ago... I am happy she did... I am happy that somebody was inspired to mix up this wonderful snack! Melt utter in a small saucepan over medium-low heat and stir in thyme,salt, and cayenne. Pour over pecans in a bowl and toss well to evenly coat. Spread out pecans in a rimmed baking sheet and bake in middle of oven until golden and fragrantly toasty, 10 to 12 minutes. 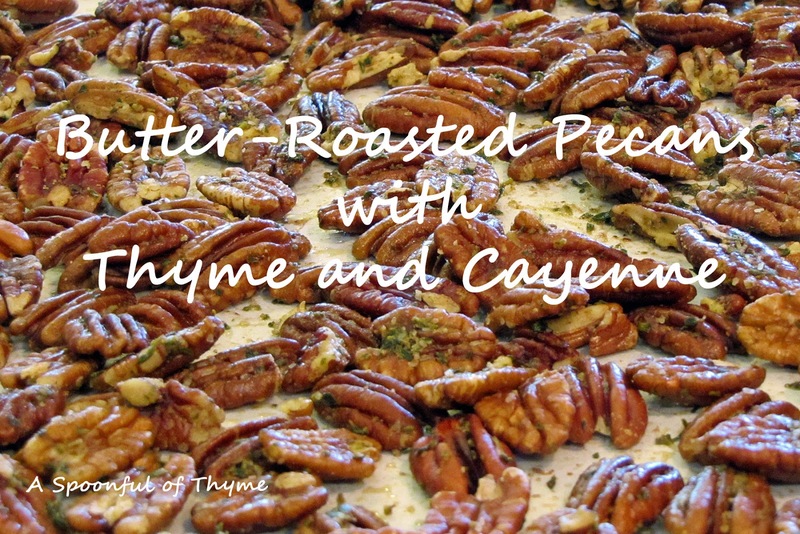 Make ahead: Pecans can be roasted 2 days ahead and kept at room temperature. Re-warm in a low oven before serving. I am sharing this treat at Full Plate Thursday hosted by Miz Helen's Country Cottage and Foodie Friday hosted by Michael at Rattlebridge Farm.